Hi ladies! Just a very quick post for you today. I'm sick once AGAIN hence the lack of posts over the last week. Being sick is CRAP. I'm overdoing things at the moment so blogging will have to be put on the back burner until I'm 100% recovered. Blogging takes a heck of a lot of time, preparation and energy that I just don't have at the moment unfortunately. I used 2 coats of Nicole by OPI Reach Out first which is a medium pink jelly. It's kind of sheer so I'd recommend 3 coats to get rid of VNL. 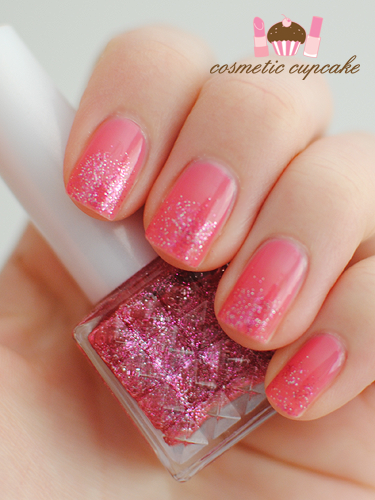 I then sponged Visee RO 602 which is a very pretty pink and silver glitter suspended in a red jelly base onto the tips. Thanks for looking! Don't forget to enter my Pink for October giveaway here! Cute mani! And how pretty is that pink glitter bottle? So gorgeous! Where do you buy your Asian nail polishes 'Chelle? That pink is really pretty! And the glitter makes it all the more gorgeous! This is super cute.I love it! I hope you will get better soon!! <3 take care!